It was late February. Just a regular day. I was serving at The Jungle and my friend Alisha comes in to get lunch after her client. We talk about all the normal stuff, but for about the 4th time that week I brought up my dreams of wanting to put a magazine together, but not having the funds to run all of the operations and definitely not being able to cover publishing cost. As a good girlfriend should, Alisha gave a listening ear. Her response that day is a huge part of my project coming to fruition. She simply said, "Well, just do it online". Seems crazy how a simple solution like that NEVER crossed my mind. I looked at her and said, " You're right, I'm doing it". I went home that day and came up with the complete outline of what I wanted my magazine to include. Fast forward a little over a month later, and here we are. I am launching a creation that has been in my head for about a year now. I have had so much overwhelming support from my circle of professionals. I seriously could not have dreamed of a better team. I've always known that they all are just as amazing as anyone doing the same thing in a bigger city. I thought why don't I make something that can show that! Love IT! 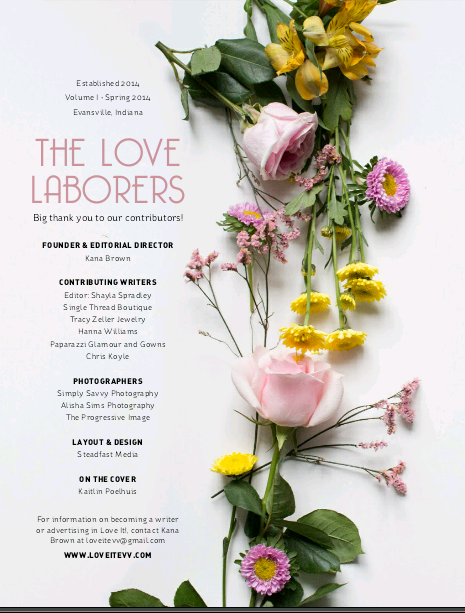 Magazine is for women by women in the Evansville Area. Love IT! will keep you up to date on everything, just like your girlfriend that always has the scoop. We will talk about inspiring stories, beauty trends , music ....and well hot men may or may not be involved. Come help us celebrate at the Love IT! Launch Party this Thursday April 24th at The Loft located inside of Boogie Nights, form 7-9. There will be music, celebratory cake & a group champagne toast at 8pm. I would love to see you all there and I can not wait to see everyone & see the continual growth of Love IT! Below are a few behind the scenes and sneak peeks of Love IT! Magazine.